After our win against LA last week, we faced Miami in the USCL Semifinals yesterday. With newly minted GM Daniel Naroditsky on Board 2, FM Yian Liou on 3, and soon to be NM Siddharth Banik on board 4, I was actually the “old man” of a talented team with hopes of winning it all. Unfortunately, we lost the match and dropped to 0-4 against the Sharks in the USCL Playoffs. My own game was the quickest of the match. Due to their better regular season record, Miami chose White on Boards 1 and 3, so I had Black versus GM Julio Becerra. There are a number of strong players in the league, but Becerra is by far the USCL leader in terms of wins. And with the white pieces in normal league games, he’s been incredibly strong – by my count, 21 wins, 18 draws, and only 1 loss for a 2698 FIDE performance rating against opposition with an average FIDE rating of 2507. His last loss in any tournament as White in my database was in 2011. All this is to say that while I would have liked to win, my primary goal was to at least hold the line as Black. For the 4th time this year, I played the Winawer French, and for the second straight match, I played (or was allowed to play) the Poison Pawn Variation (full game here). This marks the 5th time I’ve played it, and amusingly, the 1st time I did was also against Becerra in the USCL (that game can be found here). Last week, Melik played the normal 12.Qd3 here and that is what Julio played against me back in 2008. This time though, he responded immediately with 12.Nxc3. It now seems like an obvious move, but this wasn’t always the case, and looking back at my notes for that 2008 game with Becerra, I had no mention of 12.Nxc3 in my preparation. In the past couple years though, Karjakin and Svidler have chosen it in serious games, so it has some pedigree now and I had looked at it in advance of the Melik game. I had not focused on it for Becerra though, as I had predicted some other lines from him. After the win against Khachiyan in Week 3, I was back in the lineup for Week 4 as the SF Mechanics faced off against the Miami Sharks. My guess is that we’ve played them the most of any other USCL teams and they’ve had a habit of derailing us in the playoffs in the past. As usual, GM Julio Becerra lurked on Board 1 when the lineups were posted. He’s the MVP points leader in USCL history and has also racked up the most wins. We had played a couple times previously in the USCL and both those games ended in draws. Last time I played him with black, I played the Poisoned Pawn Variation of the Winawer for the first time in my life. That game can be seen here. He had played this move once before, but most recently (and by far more often), he had chosen 8.Bg5-h4. That’s where I had focused my attention, but I did look at a couple games after 9.Be3. Unfortunately, at the board, I didn’t recall too much beyond my next few moves: 9…Nd5 10.Bd3 (10.Bd2 is also popular) Nxe3 11.fxe3 Bd6 12.e4 c5. It’s a week overdue, but I figured I should write about the Miami Open. It was held from September 10-14 at the Hyatt Regency in downtown Miami. It was a much bigger tournament last year, and they banked on a big turnout again this year until Hurricane Ike decided to make its presence felt. A number of players told the organizers they would no longer make the trip because of concerns Ike would hit Miami directly. As it was, the hurricane passed by Miami at the last moment, and missed Florida pretty much altogether. Actually, this was why our USCL match with Miami went on as scheduled on Monday, September 8. It was originally under a bit of a cloud because of the same concerns (shameless plug: the writeup on the team blog is here). As for the tournament, I didn’t play up to my hopes, but I did play a pretty strong field (with 6 guys over 2500 USCF). A problem was that I kept either just missing, or just making the cut, meaning that I played up often or played way down, a product of my USCF rating being 2462 going into the tournament. I finished with 5.5/9, enough to gain 12+ USCF points and just over 1 point in the FIDE category. This will be a long post, and instead of including the full gamescores, I’m going to post some diagrams with some of the more critical positions. The knight required some help to find a safe square on c5, buty he never played …a4 to stop b2-b4. Even if he had, White is doing good there, as he can simply play Nf3-d4 and expand with f2-f4, etc. 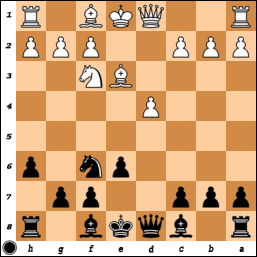 As it was, I got to play 14.b4, and after his blunder with 14…axb4 15.axb4 Na4? (15…Na6 was necessary, but Black is relegated to 3 ranks with no counterplay after 16.Qb3), his knight was permanently sidelined with 16.Nb5!. He tried to confuse the issue with a piece sacrifice on the kingside, but he lost that piece and the knight on a4 before resigning. This was a bit of a surprise, since I expected to get the black pieces in round 2 and instead got white against the top seed in the tournament. 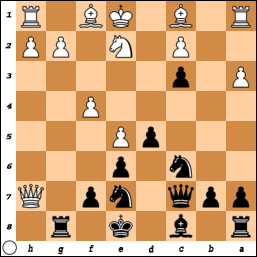 It was a Grunfeld (Mikhalevski’s specialty) where he made an implicit draw offer with a knight maneuver in the middlegame. I wasn’t aware at the time, but afterwards he said this draw is known to theory, whereas the way I refused the draw seems to be a novel approach. 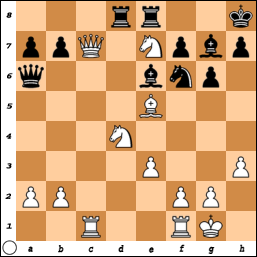 I played 19.Rfd1, as on 19…Rd7, White has the tricky 20.Nxe6! Rexe7 (20…Rxc7 21.Nxc7 and 22.Nxe8 is winning for White) 21.Nxg7! Rxc7 (21…Kxg7 is better, but after 22.Bxf6+ Qxf6 23.Qc3, white is just up a clear pawn) 22.Nxe8! Rxc1 23.Rxc1 (not 23.Bxf6+ Qxf6! 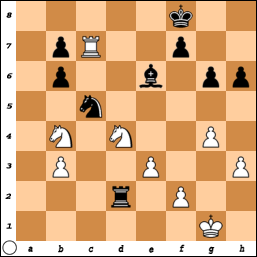 24.Nxf6 Rxd1+) is winning for White! 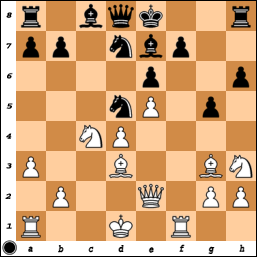 After some more excitement, we reached the following endgame after 33…h6. Black is threatening to play …Ke8-d8, leaving the rook short of air. I played 34.f4! Ke8 35.f5 gxf5 36.gxf5 Kd8 37.fxe6 Kxc7 38.exf7 Nd7 39.Nd5+ Kd6 40.Nxb6. Originally, when I played 34.f4, I thought this position was winning because I’m threatening Nc4+, picking up the rook, in addition to queening the pawn once I remove his knight from d7. However, as we approached this position, I realized he can play 40…Rd1+ 41.Kf2 Nf8, when he stops the pawn. We played the endgame for a while longer, but neither of us were really able to muster up any winning chances and the game ended in a draw. A solid result against a good GM, and while I could’ve obviously taken the draw much earlier and saved myself 3 more hours of tough play, I wouldn’t have played such an interesting game. This was a tough matchup, as it was a short turnaround after my long game with Mikhalevski. Also, Julio is a much more dangerous player with the white pieces (I had played him twice before with white, achieving won positions in both games, although he did manage to beat me from one in Oklahoma earlier this year). It was also tough because I’m still learning to play the Ruy Lopez, and that’s probably his best opening as he plays it exclusively from both sides. I was hoping to play …c6 to break up his central pawn chain, and thought that by playing …c3 first, I’d break up his queenside pawn structure a bit. Unfortunately, 15…c3? opens the b-file, a fact that Julio was quick to notice and first to take advantage of. 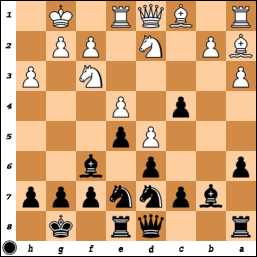 After 16.bxc3 Nb6 17.Rb1, Black’s already in some trouble and after 17…Rb8 18.Nc4 Nxc4 19.Bxc4 c6 20.dxc6 Nxc6 21.Be3, the torture began. Julio put me out of my misery pretty quickly and very accurately to pocket the full point. I should’ve just played 15…Nb6 right away, as after 16.Nxc4 Nxc4 17.Bxc4 c6 18.dxc6 Bxc6, Black has broken the central chain and can hope to play …d5 at some point. White is still a bit better, but Black’s position is certainly playable. I was aiming for that position, but with White’s pawn on c3 instead of b2. However, I never got the chance. It was disappointing to lose, but on the other hand, I did pick up a useful lesson in Lopez ideas and also a good demonstration of how to put away an opponent – I set up some tactical tricks near the end and many an opponent would fall for them thinking they faced no difficulty. But that was precisely when Julio started to spend more time to make sure he was not allowing any counterplay. This was a frustrating game, because my opponent played the Exchange French as White and tried to exchange all the pieces as quickly as he could. I actually managed to find a good plan to gain a very tiny edge, but then I misplayed it a bit. My biggest mistake was burning up a lot of the clock debating whether to castle kingside or queenside. In the end, I think my decision to castle kingside was right, but it cost me too much time, and then I followed it up poorly, not playing incisively enough on the queenside. The game ended in a draw after a long struggle. Here, he played 18…N7b6 19.Nd6+!? (19.Nd2 was also possible) Bxd6 20.exd6 Na4!. Actually, he touched his knight at first, and I thought he was going to move it to d7 (which allows the beautiful finish 21.Qxe6+! fxe6 22.Bg6#), but then he sat and thought for a bit longer and played it to a4, which I think might well be the best move in the position, even if he hadn’t touched his knight! The threat is …N(a/d)c3+, winning the white queen, while also faciliating …Bd7 and …Rc8 or …Qb6 in some lines. I thought for a while and played 21.Ke1! 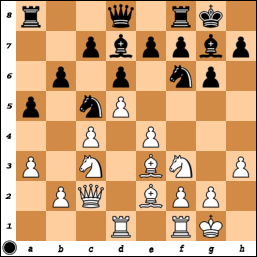 !, which escapes the checks on b2 and c3, while simply threatening to continue with the kingside attack. After 21…Bd7 22.Be5 f6? (23…Rf8 was necessary; 23…Rg8 loses to 24.Rxf7!) 23.Qh5+ Kf8 24.Bxf6, Black resigned and I was back in the win column.